Peeps, it seems that all my writerly friends are doing a ‘breakdown of 2012’ blog post. I’m not so industry savvy that I can analyze all the shizz that went down in the publishing world this year, so I thought instead I would share some of my writely-themed 2012 highlights with you. Beware: This post gets all sorts of sentimental. *cue church choir* In 2012 bookisblurb was born!! I’d been wanting to start a blog for forever and in August of this year I finally took the plunge. It’s really hard putting yourself out there, but you guys have made me feel very welcome. I’m so grateful to everyone that has taken the time to visit my little corner of the internet and left a comment or ‘liked’ a post. 2012 was the year in which I fangirled for weeks on end because I got a tweet from the fabulous Courtney Summers and the wonderful Teri Terry about the reviews I wrote on their books. How cool is that? Still makes me squeeee!!! And finally in 2012 I found two excellent critique partners/friends (via Twitter). Both of whom are crazy-brilliant and destined to be bestselling authors. Nia, Megan, I love you both, you’ve made my book a million times better and without you I would probably have quit this writing malarkey and enrolled in clown college. In closing…you are the master of your own destiny, you know that, right? If you want 2013 to be a great year, make it happen. I hope you all had a lovely Christmas, have a fantastic New Year and blow 2013 away with your brilliance. Wishing you all lots of love, luck and good health. 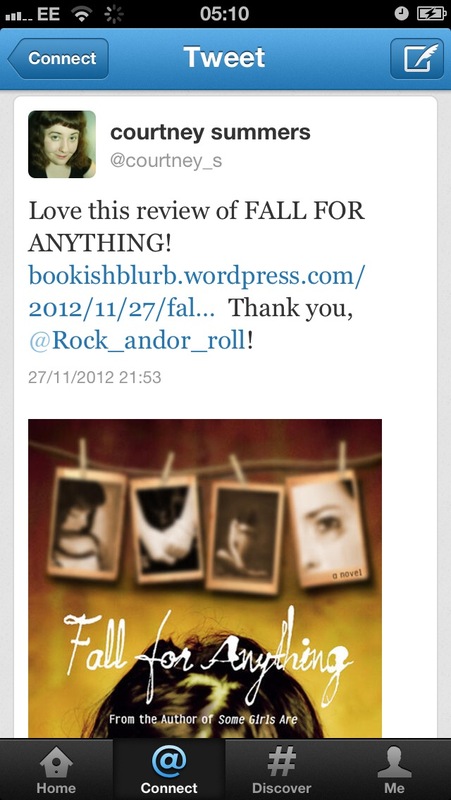 Posted by bookishblurb on December 31, 2012 in Buzz and tagged 2012, 2013. I hope all your writing dreams come true in 2013!